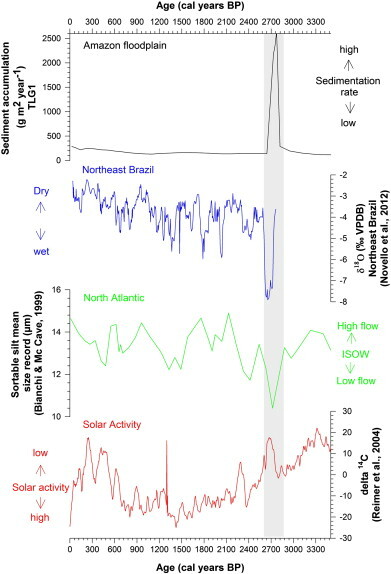 A paper published today in Palaeogeography, Palaeoclimatology, Palaeoecology finds extreme flooding in the Amazon 2700 years ago was related to a sharp decrease of solar activity. According to the authors, the low solar activity of the 2700 year ago event "has been also observed in other sites in South America and other regions in the world, although different impacts can be observed in each system." The authors postulate the very low solar activity 2700 years ago "seems to have provoked cooling on the continents and a southward shift of the ITCZ [Intertropical Convergence Zone] associated with a probable reduction in the Atlantic Meridian Overturning Circulation [AMOC]" ocean oscillation, and in-turn associated with extreme flooding in the Amazon. The paper also shows that solar activity at the end of the record in the 20th century was at the highest levels of the past 3,500 years. The paper joins many others finding potential solar amplification mechanisms related to the hydrological cycle, and to ocean & atmospheric oscillations. A 2700 cal yr BP climatic event provoked extreme floods of Amazon. This event is linked regionally with an intensification of South American Monsoon. It also corresponds to a southward position of ITCZ. Globally the 2700 event is related to solar irradiance minimum. Climatic conditions are one of the most important factors affecting hydrological processes in fluvial systems. Higher discharges are responsible for higher erosion, greater transport, and also higher deposition. Consequently, sediment accumulation in Amazonia floodplain river-connected lakes can be directly related to hydrological patterns of the Amazon River mainstream. In this context, we analyzed five sediment cores taken in two floodplain systems situated in the lower Amazon River, to investigate sediment accumulation patterns during the Holocene. Our records show abrupt fluctuations in sedimentation rates in lakes that can reach more than 2 cm/yr during some periods. We find that in all cores, sediment stratigraphy is characterized by packages of sediments of uniform age, which are typically 10–80 cm thick and present a variegated color. The 14C age of the upper package is about 2700 cal yr BP. During this abrupt event, sediment accumulation rates in floodplain lakes can be at least 200 times higher than those of “normal” periods. This sedimentation event is interpreted as being the consequence of one or several successive extreme floods. The 2700 cal yr BP event has been also observed in other sites in South America and other regions in the world, although different impacts can be observed in each system. This event probably corresponds to a conjunction of favorable conditions for extreme Amazon discharge associated with the Middle to Late Holocene increase of austral summer insolation and shifts of the Intertropical Convergence Zone (ITCZ) from northern to southern positions. In this context, a marked negative peak in solar irradiance at 2700 cal yrs BP seems to have provoked cooling on the continents and a southward shift of the ITCZ associated with a probable reduction in the Atlantic Meridian Overturning Circulation. The last graph on this page is fascinating especially since the data reflects the conditions in the southern hemisphere. Hard to know what it means for the northern hemisphere. Presumably the paper is not referring to variations in insolation arising from changes in the orbital parameters but changes in solar intensity and possibly the solar spectrum and possibly the solar wind and magnetism is implicated..
Let's have a go at matching the positive and negative peak and the intervening trends with human events. Discontinuity in Greek Civilization, Rhys Carpenter, Cambridge Uviversity Press, 1966. R. A. Bryson and other have analysed the climatological conditions of that period based on Carpenter's lectures . This period is followed by the rise of the Greek City states and the Athenian federation. The gray band marks about 700 BCE (BC), about the time Rome was founded near the end of 300 years of low solar activity. Note the rise in solar activity from 700 BCE (BC) to 500 CE (AD) roughly matching the rise and peak of the Western Roman Empire. Then the fall in solar activity to around 800 CE (AD) and the recovery of solar activity corresponding to the Medieval Warm Period until about 1350 CE (AD) around the beginning of the Little Ice Age, well documented by H.H. Lamb and others. The negative solar peak corresponds with the peaking of sea ice around Iceland roughly 200 years ago. The modern rise in solar activity corresponds to the Modern Warm Period about which I make no comment except to say that in the 1940's I preferred football to hockey as a sport and did not enjoy at all the brief cold period in the late 1960's and early 1970's. I wonder what the full paper says contributed to the variations in solar activity? Does this match the 10Be isotope record? Why the ITCZ would move north and south if insolation intensity etc were the driver rather than orbital parameters? "The authors postulate the very low solar activity 2700 years ago "seems to have provoked cooling on the continents and a southward shift of the ITCZ [Intertropical Convergence Zone"